I'll take a break from Farm Bill talk (next up: the other programs) to bring you some delicious from Nebraska. This time, I was clued in to the best part of the University of Nebraska-Lincoln campus: The Dairy Store! Yes, the UNL campus has an area for ice cream making as well as other dairy products. 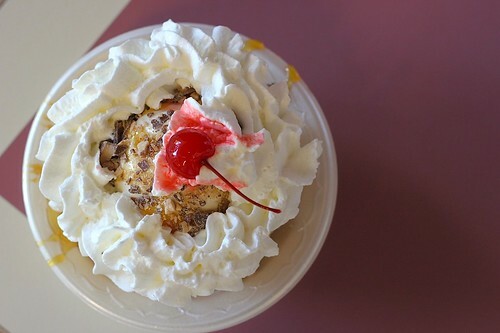 Then locals can stop by and eat the ice cream. 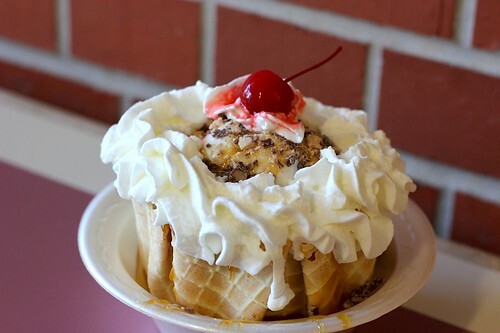 In sundaes like this one: the Husker Crunch Sundae. Butter Brickle ice cream (I don't even know what that means! I love surprise ice cream flavors!). Butterscotch. Heath Bar bits (Heath Bar bits are totally underutilized in New York's ice cream shops). Jar whipped cream (stop being pretentious about only using fresh whipped cream. We all know the joys of Reddi-wip.) Maraschino cherry! And it was some of the smoothest ice cream I've had in a long time. All for $4.50. Holy baloney, Mid West, you make me love you.